"Sheep have no great judgment, it must be said; they graze where they are and leave the place only when there is only soil left to bite. It is indeed about them that one can say that they do not see beyond their nose, because of their laziness to watch." Do you know the opposite of a sheep? God, this woman was so great, powerful, intelligent, wonderful, visionary! I admire her and I like her! Emotional reasons: it is a very beautiful story of woman, love, adventure. Historical reasons: through her different and so well and deeply painted characters, we understand the stakes, aspirations, contradictions of this troubled period that was the French Revolution of 1789 the years that followed. 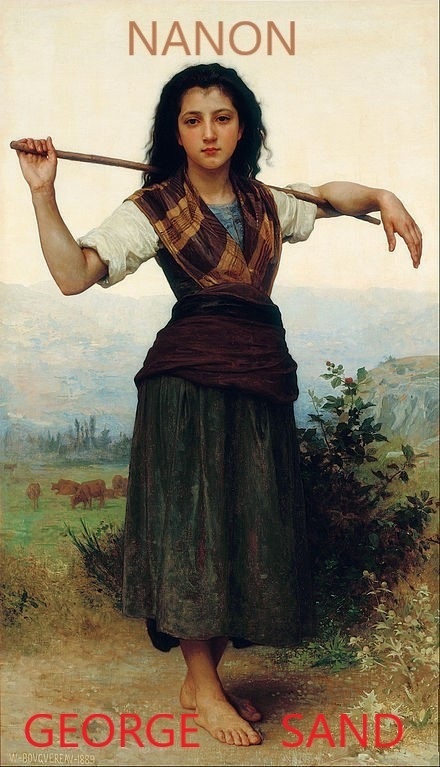 Reasons of heart: the character of Nanon and the men around her are eminently feminist. Reasons of revolt: why, but why do we have dozens of films about The Three Musketeers, The Red and the Black, Madame Bovary, Germinal, Les Misérables and other novels by 19th century French male authors and why not one film was shot from Nanon? Is it because George Sand dared to think differently than others, when women were born to be unhappy? George Sand had some courage, and she never pityed herself. Let's hope that the French National Education thinkers who choose which authors will appear in the textbooks of French high schools, will one day have a hundredth of George Sand’s courage and dare to give her a more important place than the 0.1% she currently has! Because we won’t be able to live forever leaving only 8 even less: 2% of place to the female authors in the French highschool textbooks. Make people believe that male authors are all the 19th century thought is a lie. Today, in the 21st century, this is stifling 50% of the population who will not allow it much longer! The time has come to complete what women like George Sand had begun: to make women aware that they are entitled to 50% of the world's space. In short, read Nanon, there are so many beautiful things in this historical novel, there is so much to be gained from reading George Sand! It's as good for the mind as it is for the heart!